Adams Heating and Cooling can help you with all of your heating needs, including In Floor Radiant Heat installation, repair, and maintenance. Adams is your trusted source for the greater Kalamazoo area. What is In Floor Radiant Heat? In floor radiant heating systems supply heat directly to the floor of a house to warm the living area. The systems depend largely on radiant heat transfer - the delivery of heat directly from the hot surface to the people and objects in the room via infrared radiation. Radiant heating is the effect you feel when you can feel the warmth of a hot stovetop element from across the room. Why choose Radiant Heat installation? Radiant heating has a number of advantages. It is more efficient than baseboard heating and usually more efficient than forced-air heating because it eliminates duct losses. 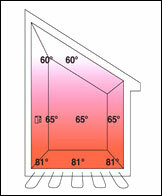 People with allergies often prefer radiant heat because it doesn’t distribute allergens like forced air systems can. Also, it provides quiet, even heat, and works with boilers, heat pumps, or hot water heaters with space heating capability. When should In Floor Radiant Heat installation occur? Installation is best for homes that are being remodeled or built new. Areas in the home that have wood flooring or tile like bathroom areas are best because the floor will be warm. What Radiant Heat maintenance is recommended? Yearly maintenance on the source that supplies the heat is the best routine. Adams Heating and Cooling can install, repair, and maintain In Floor Radiant Heat for you in the greater Kalamazoo area. They sell the Wirsbo Radiant Heat models.